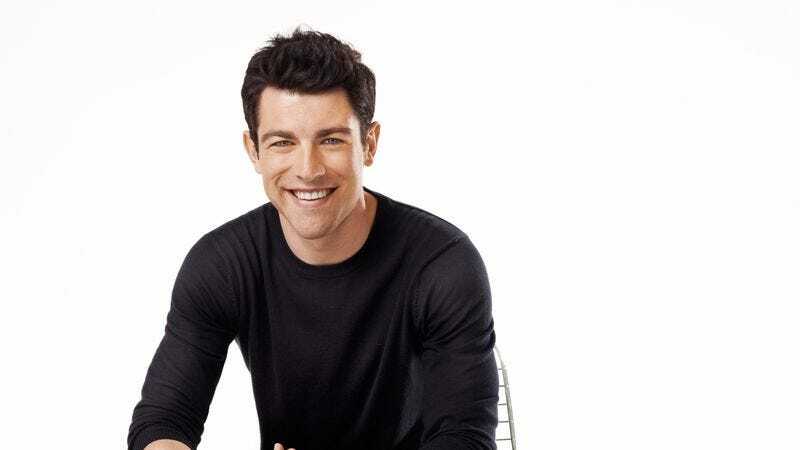 After spending the better part of a decade bouncing between one-off guest appearances and recurring-character roles, Max Greenfield is understandably thrilled to be a regular on Fox’s New Girl, which was just picked up for a second season. In addition, getting the opportunity to play one of Zooey Deschanel’s roommates—the ostensibly studly Schmidt—has resulted in Greenfield receiving countless compliments about how he’s playing one of the funniest TV characters in recent memory. With the New Girl season finale on the horizon, Greenfield chatted with The A.V. Club about when he first got a handle on Schmidt, his thoughts on the burgeoning Schmidt/CeCe relationship, and whether using the word “adorkable” on the set is a punishable offense. The A.V. Club: You’ve earned your stripes on television over the past several years, but how did you become part of the New Girl ensemble? Seems like it would’ve been a pretty competitive field to work with Zooey Deschanel. Max Greenfield: Yeah, but, y’know, she was up for the role, but she wasn’t even set yet when I first auditioned for the show. There were rumors, but there are rumors every year that this movie star or that is gonna be doing a TV show. [Laughs.] Everybody was, like, “I don’t know if this is really gonna happen, or if it’s just some crazy rumors.” So I auditioned for it, and I think Zooey was set somewhere in the middle of my audition process. It was just one of those situations where, unlike most of the shows I had tested for in the past, where I was, like, “Oh my God, I can’t believe it, I’m never gonna get this,” this was more like, “I am never, ever gonna get this.” [Laughs.] But luckily it worked out. AVC: Your character has evolved since the show began. What did you think of Schmidt when you were first handed the role? MG: It was interesting. It certainly… well, yeah, it has evolved. There was a decent period of figuring things out. ’Cause you never know with a TV show, dude. Everything gets rewritten so much, and everything you think you’re playing is not what you’re playing, and the character’s different. I thought he was a lot cooler of a guy maybe in the beginning, and then we started doing wardrobe tests, and in the pilot, there was that scene where he goes to that Wild West charity auction. [Laughs.] And he wears that full-on cowboy outfit, and—Deborah Maguire does our wardrobe and is so amazing, and she went all-out on this cowboy outfit. And we put it on, and I think… I don’t know if it was a collective thing, but I remember thinking, “Oh! Oh, this guy is ridiculous. And if he’s gonna wear this, that gives me a little leeway to make him just a little bit more interesting than he’s painted here.” And “interesting” is a nice way of saying it. [Laughs.] “Dumber” is really more appropriate. Or, y’know, a little more clueless. AVC: Schmidt seems to have been declared “most awesome TV character ever” among the shows that premièred during the 2011-2012 season, but when New Girl first kicked off, the big critical complaint was that none of the characters seemed all that terribly defined. He’s come a long way very quickly, in other words. MG: Oh, totally. You know, I think that’s like any good TV show: You start off, and you hope that your characters really define themselves and find their own space. I think Schmidt found his space very early, and I totally credit that to the writers. They really were just, like, “Oh, we get this! We get what the actor’s trying to do, let’s keep pushing it in the direction that you haven’t seen on TV.” And it just worked from the beginning, almost, and it kept working, and it’s worked every since. To be in that position is, like, the dream. [Laughs.] Because, y’know, the alternative is that you’re sitting on a TV show forever, going, “What are they doing with me? Every week, I don’t understand. What’s happening? One week I’m playing this, the next week I’m playing something totally contradictory. I don’t know what I’m doing anymore!” For this show, it all just kind of made sense in this character. MG: [Laughs.] Yeah, and, y’know, I think that’s the greatest compliment that we’ve gotten as a show. And I say “as a show” because… You hear, like, “Oh, well, Schmidt’s the breakout character,” and this and that, and as nice as that is, and as much credit as I want to take for it, it’s a total result of the writers doing such an amazing job of giving me such great stuff, watching what I’ve been doing and really understanding it and giving me more of that. And to the credit of the rest of the cast, I so much play off of their reactions. They give me so much. For instance, Jake Johnson, who’s so great and plays Nick on the show, when we did the pilot… [Laughs.] He would always give me these looks during scenes like, “What are you doing?” But in, like, an “I can’t believe I’m best friends with you” kind of way, which allowed me to go a little off the charts and continue to go in that direction. So I think the character has been totally informed by everybody. AVC: Was there a first moment onscreen where you started to feel like you’d found the real Schmidt? MG: I think it was actually in the episode right after the pilot, where they gave me the opening scene, basically, and it was me just kind of running around my room, asking Zooey and Jake where in the room I looked the sexiest. [Laughs.] It was definitely a leap, you know what I mean? Everything seemed a little bit more grounded in the pilot. I mean, he was taking off his shirt, there were some other little things here and there, but it seemed a little more grounded. With the next episode, though, it was, like, “Oh, so this is how we’re doing this.” And I think it kind of set the tone, because it worked so well. It allowed us to really go anywhere after that. AVC: Thanks to Fox’s initial promo swag for New Girl, many of us TV critics were sent their very own Douchebag Jar. Given that it was poised as key to their promo efforts, it’s impressive that that particular gag hasn’t been worn into the ground. AVC: What was your reaction when they decided to move forward with the Schmidt/CeCe romance? They could’ve kept the “will they or won’t they” going on for a while, but they cut to the chase pretty quickly. AVC: Lamorne Morris came into his own pretty quickly as Winston, but has there ever been any talk of bringing back Coach—Damon Wayans, Jr.’s character from the pilot—for a one-off guest appearance? MG: I think he’s locked up on Happy Endings for the moment, which is a great show, so I don’t know that Coach’ll be coming back any time soon. Or at least ABC won’t let him. [Laughs.] But Lamorne came in and auditioned for the pilot, for the role Damon ended up getting, and was offered a CBS show the same day. So he went to the CBS show. And then when it came back around after losing Damon, it seemed like a pretty obvious choice to have him come in, and he’s been phenomenal since day one. AVC: Has the word “adorkable” officially been banned from the set? MG: No, not at all! I think we embrace it as much as possible. AVC: Series creator Liz Meriwether may be even more adorkable than Zooey Deschanel. MG: [Laughs.] I will only say that they are both pretty adorkable. But yeah, I think it would be silly not to embrace that word. Like, really, the only reason you wouldn’t embrace something like that is if you were, like, “Oh, I’m too cool.” And I think that’s a lot of the reason why our show works: No one—and I can speak for myself wholeheartedly on this—is trying to look cool on this show. We’re trying to make the funniest show and the most real and honest show we can make. I can assure you that no one, especially me, is showing up on the set any day of the week saying, “So I want to look cool in this scene…” [Laughs.] I’d much rather look adorkable than cool. AVC: What’s your favorite part of Schmidt, now that you’ve seen him fleshed out a bit more over the season? MG: You know, I think we’ve managed to get to a place really quickly where he’s safe to the audience. Like you were talking about before, with the reviews early on, it was like, “We don’t know why we’re feeling this way—we shouldn’t, but we are—but for whatever reason, we feel safe with him saying all of these weird things.” And having found that place early on, it’s given us the opportunity and the freedom to do whatever we want. And I think that’s the best part. That he’s harmless. We’ve made him harmless, and because of that, we can go anywhere with him. AVC: You mentioned that you’ve been able to bring a bit to the table as far as helping develop Schmidt. How much of his Judaism has come directly from your experiences? MG: I think myself and one of our showrunners, Dave Finkel, who’s often on set, have really embraced Schmidt’s Judaism. [Laughs.] And quite often have fits of laughter when we get to insert it into a script. It’s not always in the weekly episodes, but we manage to find some place to get a little bit of Judaism in every week. AVC: Word has it that you yourself had a Saturday Night Live-themed bar mitzvah. MG: Yes, I did, and it was a great event. [Laughs.] It was an amazing, amazing event. We had headshots of the cast members that my mother got from the studio, I guess, and they were on every table. Dennis Miller, [David] Spade, [Adam] Sandler, [Chris] Farley… it was great stuff. I’m still a big fan of the show, but when I was younger, I was just obsessed with it. AVC: One of your past gigs has recently started to be rerun on SOAPnet: Veronica Mars, where you played Deputy Leo D’Amato. MG: Yeah, I heard! I’ve been getting all these Tweets saying, “We’re watching a Veronica Mars marathon!” I thought that was so cool. AVC: What are your recollections of working on the show? MG: Uh, that it was great. [Laughs.] It was amazing, every part of it. It was very similar to New Girl, although I was a lot younger, and I don’t think I really knew what I was doing. But it was just such a great group, and Rob Thomas was so great and had such a vision, and Kristen [Bell] was just incredible. It’s nice when you can go to work and don’t have to worry about anything else except for what your job is. So many times, you’re like, “I don’t know what I’m doing, I don’t trust you people, I don’t know what’s happening. I mean, I’m here and I’m going to say my lines and then get out of here, but this is not fun, nor what I really wanted to do when I started doing this.” So when you go to a set and you just fully trust everybody, you know how hard everybody’s working, you know that the people doing it are good and have such a strong vision—that’s exactly my experience on New Girl, and what my experience on Veronica Mars was like. Everybody was just so great. The on-set producers, the writers—it was just a really good environment. AVC: You also earned acclaim for your work on ABC Family’s Greek, where you played Calvin’s boyfriend, Michael. MG: Yeah, y’know, that was another one of those shows. [Laughs.] Same kind of experience. I knew [Patrick] Sean Smith pretty well, who created the show, and I knew some of the other writers, like Jonathan Abrahams. They were really good guys, and I knew they would take care of that character and the storyline. They asked me to do it—I’d tested for the pilot, and they’d come and asked me that season to come back and do this arc. It was great. I thought Paul James [who played Calvin] was a really great actor, and we had a lot of fun with it. I thought we did a good job with it. It was a very cool experience. AVC: GLAAD recognized the show because of you and Paul, didn’t they? MG: They did, yeah, and that was also really cool. That was the first time I played gay. The second time was actually on Happy Endings. AVC: Is there a favorite project you’ve worked on that didn’t get the love you thought it deserved? MG: Well, I mean, Veronica Mars. I would’ve loved for that to have done better. AVC: Are you in for the movie, if it ever happens? MG: Who knows? [Laughs.] I brought it up with one of the producers the other day, and he was like, “We can’t talk about this.” And I was, like, “I’m not asking you or anything, but can’t we just talk about it a little bit?” “I can’t. It’s just this whole thing…” So I don’t know. I don’t know if anybody knows. AVC: You were also part of a short-lived sitcom called Modern Men with George Wendt. I talked to him a few years ago, and he still seemed surprised that show didn’t take off. MG: George Wendt is a saint. And one of the finest American actors that we have. It was literally a dream come true. I have friends that are still jealous. I mean, New Girl is great, but it would’ve been way cooler if the Wendt show had gone on longer. AVC: Well, at least you’ve gotten word that New Girl has scored a second season. Can you offer up any details about the finale of season one, or where we’ll see Schmidt come season two? MG: Um… There’s some good times, there’s some bad times. [Laughs.] You know, they are inching closer to a real relationship, and with that, I think, comes some really good things and some bad things as well. I think emotionally, it’s something they both want, but maybe aren’t ready to have. AVC: Will we ever see Schmidt fully grown up? MG: Absolutely not. [Laughs.] I mean, that happens, the show’s over.